Our best-selling product is our Cut Brick Veneer, available in several color ranges. It is easy to install without the added weight of a full-size brick. The brick we reclaim from the demolition of old buildings was manufactured from the late 1890s through the mid 1960s. There are several color ranges available. 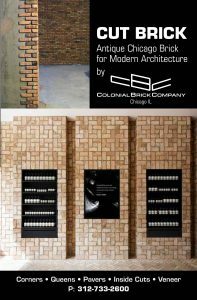 These bricks can also be used as pavers in warmer climates. Reclaimed from the streets of Chicago and ranging in age from the mid-19th century to late 1920s, pavers & cobbles can withstand harsh environments and more weight than brick. Conveniently located just south of Chicago’s Loop in Pilsen, we work with Architects, Designers, Builders, Wholesale Distributors, and Homeowners across the country and worldwide for both residential and commercial projects, small and large. Download our brochure (PDF) for brick and paver dimensions and more information.